The "air pirate"--the pilot-bandit who uses his plane to rob other planes or, occasionally, ground targets--was for the most part solely a product of the imagination of pulp and radio writers. (There was the robbery of the cathedral in Barcelona, which I'll get around to describing one day, but that was a unique event). (This was from the Tyrone Daily News of Tyrone, Pennsylvania, 7 December, 1926). ...it's just that the Now seemed so much more...entertaining and futuristic, I guess, than 2010 does. (Even granting John Scalzi's Mark Twain-esque observations about modern computers). Yes, yes, new Apple trackpad and possible cures for Bubble Boy syndrome are all very nice. But...talking robots at the War Department! Tell me something inside you doesn't thrill at the thought of that. but it involves Adam, Eve, Satan, and "Signor Gorilla." Click on the image to open the .pdf of a 1919 article from the Winnipeg edition of the Icelandic newspaper Heimskringla. "The Mechanical Man--He's In Laredo!" The mechanical man or robot was released from a huge box in front of the Laredo Times office on Monday evening at 6 o'clock and soon thereafter made his first public appearance at the Bohemian Club in Nuevo Laredo. In both instances numerous curious folks were on hand to see what they could see and decide for themselves whether it was robot or man. Those who got an eyeful of the figure Monday evening were puzzled. Every movement of the figure was that joint-jerking action of the mechanical robot. His walk, handshakes and nods had all the laborious grace of a doll made of toothpicks. But the figure was firm and rounded and the wax face is so perfect that it is almost human. But "Robot" drives an automobile with the same ease and precision of a regular driver, which again puzzles the observer as each movement is carefully watched. During the week "Robot" will drive a Ford and a Chevrolet on alternate days and will appear at the Gateway Chevrolet Co., Laredo Auto Sales Co., Bohemian Club, Labella Jardinera, Stowers Furniture Co., Franklin Bros. Department Store, Lion Music and Jewelry Co., Southern Plumbing C. and the R. and R. Royal Theatre. Arrr, mateys, that be trayf! Edward Kritzler’s Jewish Pirates of the Caribbean is a fun read—well-documented but not scholarly, fast-moving and well-told. Yes, some of the pirates were Chosen, and some of these Chosen…well, let’s take a look at Samuel Palache, shall we? To quote Kritzler, “he was a giant—merchant, pirate, conspirator, rabbi, ambassador, and founder of Amsterdam’s Jewish community.” No friend of Spain (for reasons obvious if you know anything of the history of Spain and the Jews), he took great pleasure in taking their ships. Palache regularly ran guns and munitions to the corsairs in Morocco in exchange for Spanish booty. In the spring of 1614, when Palache was in his sixties, he borrowed five thousand florins from the Dutch government (with a surety from Palache’s personal friend, Maurice of Nassau, the Prince of Orange) and equipped two ships, crewed almost entirely by former pirates. Palache sailed to Morocco and got a privateer’s license. (Sidan, the ruler of Morocco, had been forced to kill his brother, who led a Spain-backed rebellion of radical Muslims, so Sidan had no love for Spain). Palache raised the black flag and set sail. Again quoting Kritzler, “carved on the bow of his ship was a phoenix, a mythical bird that lives a thousand years, is consumed by fire, and rises afresh from the ashes. It was his way of saying that Inquisition flames might burn individual Jews, but could not destroy their ancestral faith.” Naturally, Palache, as a Rabbi, took care to make sure his ship followed Halakhah, and employed a Jewish chef to prepare kosher meals. Palache—remember, in his sixties—captured a Portuguese caravel and a Spanish galleon. 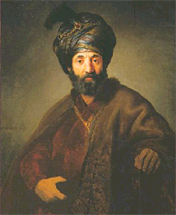 Complaints to the Dutch government were met with the bland demurral that Palache, as a Moroccan-sponsored privateer, was a foreign pirate, and, hey, despite his living in Amsterdam and having founded the Jewish community there, he had nothing to do with the Dutch. In a recent article in the Green Living Tips newsletter, Michael Bloch reflects on the notorious flaws in BP’s emergency response plan for the ruptured oil well in the Gulf of Mexico. Apparently the plan was more of a cut-paste-and-print job than robust contingency planning. Nobody reviewed it well enough to catch the part about oil spill impact on walruses. “While these walruses would certainly be a wonderful tourist attraction, you probably haven’t heard of their presence in the region as it appears they haven’t been in the Gulf of Mexico for 3 million years,” Bloch writes. Evidently material was cribbed from a similar document for a different part of the world. The plan also included the emergency contact number of a marine biologist who died five years ago.